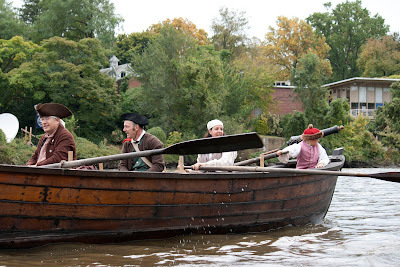 Getting chased out of New Bridge by Rebels, RE-ENACTORS ON BATTOE 'MOON' ON THE HACKENSACK RIVER. Photos by TOM HART/ FREELANCE PHOTOGRAPHER. 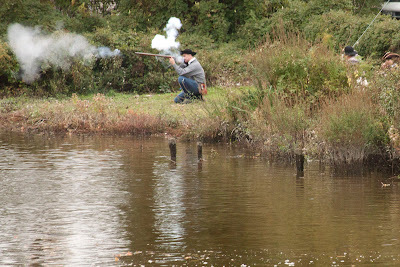 Firing the swivel gun to keep back them rebels. Photos by TOM HART/ FREELANCE PHOTOGRAPHER. Rifleman on riverbank. 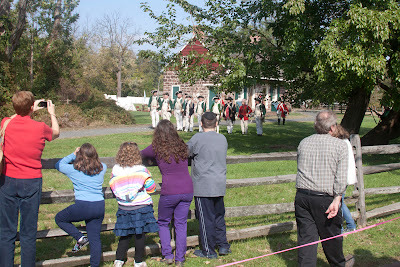 Photos by TOM HART/ FREELANCE PHOTOGRAPHER. 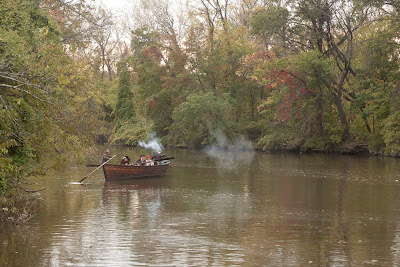 RE-ENACTORS ON BATTOE 'MOON' ON THE HACKENSACK RIVER. 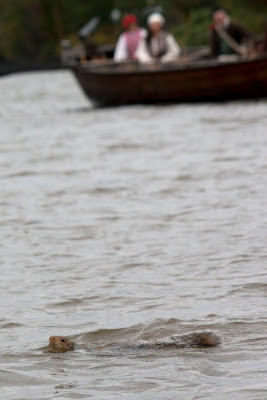 Photos by TOM HART/ FREELANCE PHOTOGRAPHER. 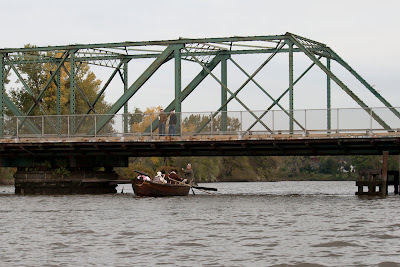 crossing under the Farleigh Dickenson footbridge and conversing with 'natives, BATTOE 'MOON' ON THE HACKENSACK RIVER. 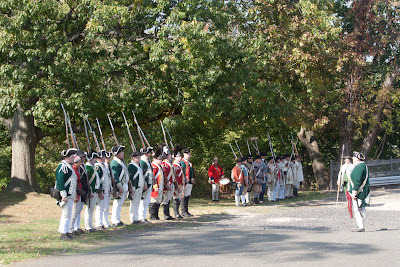 Photos by TOM HART/ FREELANCE PHOTOGRAPHER. 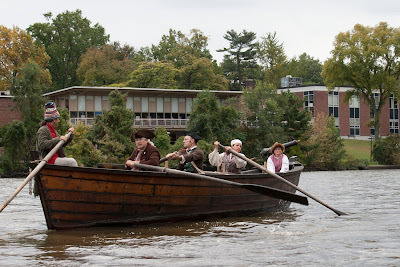 Passing Farliegh's student hall, RE-ENACTORS ON BATTOE 'MOON' ON THE HACKENSACK RIVER. 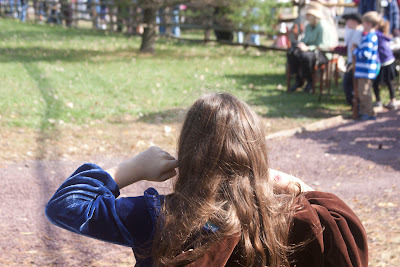 Photos by TOM HART/ FREELANCE PHOTOGRAPHER. 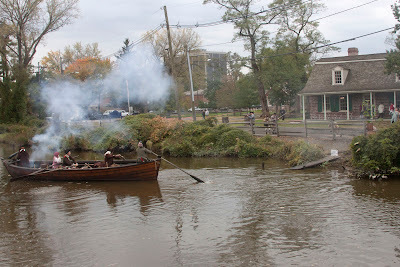 Passing the library as well, RE-ENACTORS ON BATTOE 'MOON' ON THE HACKENSACK RIVER. 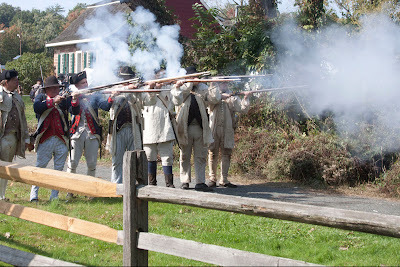 Photos by TOM HART/ FREELANCE PHOTOGRAPHER. 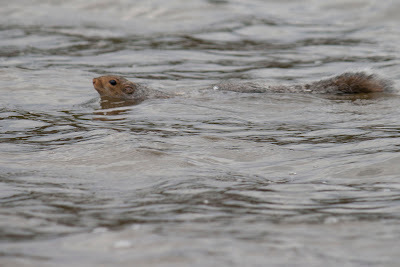 Squirrel crossing the river...big swim for a little guy. 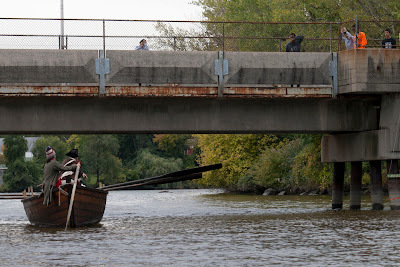 No one told him it about the footbridge. 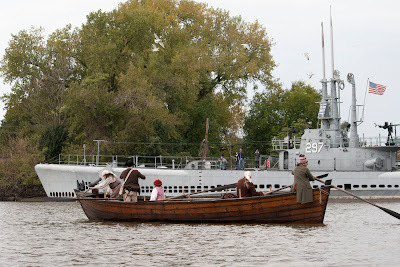 RE-ENACTORS ON BATTOE 'MOON' ON THE HACKENSACK RIVER. 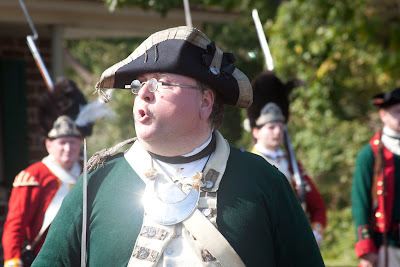 Photos by TOM HART/ FREELANCE PHOTOGRAPHER. 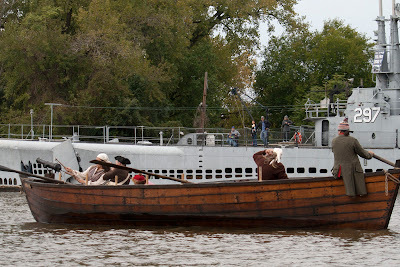 Squirrel and RE-ENACTORS ON BATTOE 'MOON' ON THE HACKENSACK RIVER. Photos by TOM HART/ FREELANCE PHOTOGRAPHER. 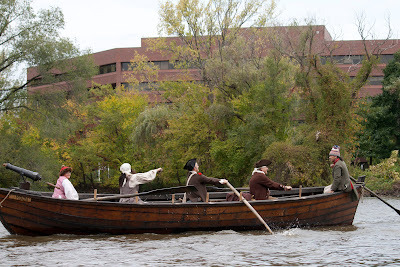 Passing University Plaza, RE-ENACTORS ON BATTOE 'MOON' ON THE HACKENSACK RIVER. 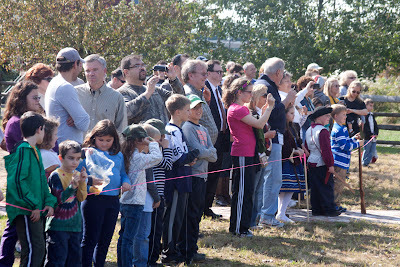 Photos by TOM HART/ FREELANCE PHOTOGRAPHER. Approaching Johinson Park and the home of tomhartphoto.com. Photos by TOM HART/ FREELANCE PHOTOGRAPHER. 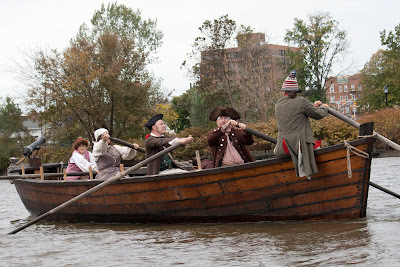 RE-ENACTORS ON BATTOE 'MOON' ON THE HACKENSACK RIVER passing the home of TomHartPhoto.com. Photos by TOM HART/ FREELANCE PHOTOGRAPHER. 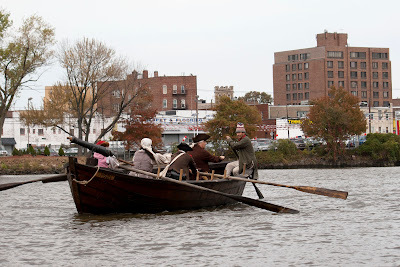 Passing the home of Tom Hart Photo where these very words are being typed (2nd window from top and left), RE-ENACTORS ON BATTOE 'MOON' ON THE HACKENSACK RIVER. Photos by TOM HART/ FREELANCE PHOTOGRAPHER. 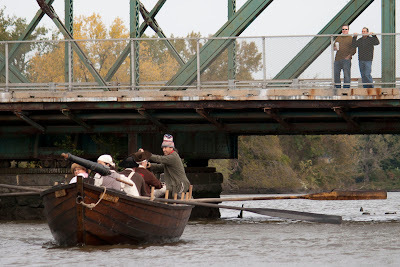 Crossing under the Salem Street Bridge, RE-ENACTORS ON BATTOE 'MOON' ON THE HACKENSACK RIVER. Photos by TOM HART/ FREELANCE PHOTOGRAPHER. touching off the swivel gun to salute the Ling. Photos by TOM HART/ FREELANCE PHOTOGRAPHER. 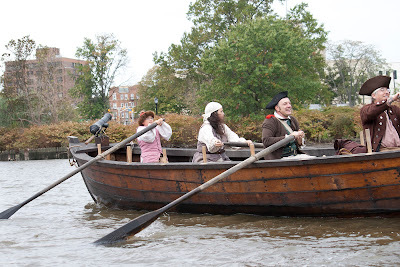 With the Ling, RE-ENACTORS ON BATTOE 'MOON' ON THE HACKENSACK RIVER. Photos by TOM HART/ FREELANCE PHOTOGRAPHER. 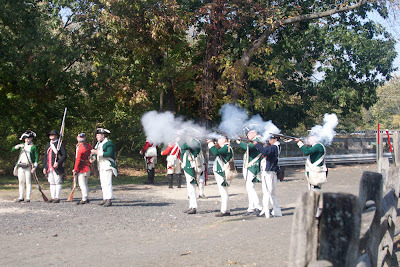 BRINGING TO LIFE THE RUNNING BATTLES THAT OCCURRED IN BERGEN COUNTY DURING THE SPRING OF 1780. Photos by TOM HART/ FREELANCE PHOTOGRAPHER. Crowds watching. Photos by TOM HART/ FREELANCE PHOTOGRAPHER. Too loud?Photos by TOM HART/ FREELANCE PHOTOGRAPHER. 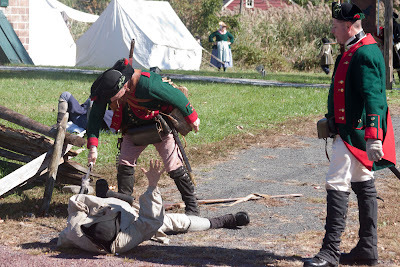 Finishing off the wounded as was often done in Bergen county. Photos by TOM HART/ FREELANCE PHOTOGRAPHER. 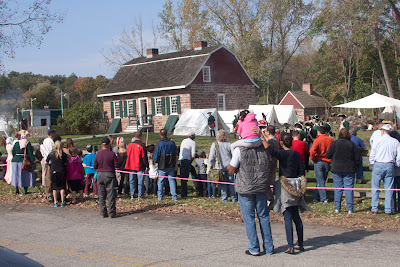 Crowds watching...BRINGING TO LIFE THE RUNNING BATTLES THAT OCCURRED IN BERGEN COUNTY DURING THE SPRING OF 1780. Photos by TOM HART/ FREELANCE PHOTOGRAPHER. Photos by TOM HART/ FREELANCE PHOTOGRAPHER. Stealing cartidges from a 'dead' colonial...also probably realistic. Todd of the historical society addessing the troops and throngs. 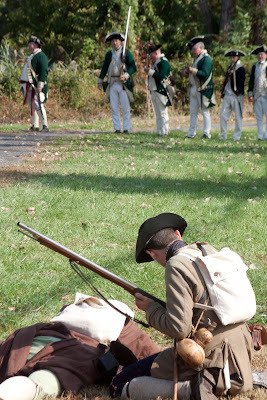 Photos by TOM HART/ FREELANCE PHOTOGRAPHER.